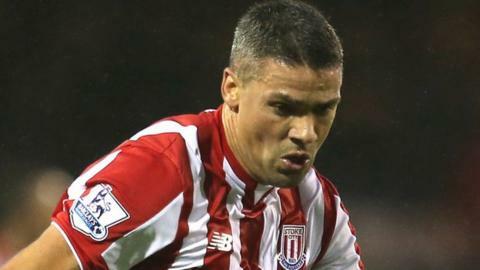 Stoke City chief executive Tony Scholes is hopeful of a "compromise" in the ongoing contract disagreement with Potters striker Jon Walters. The 31-year-old Republic of Ireland international, who has been with the Potters since August 2010, is in the final year of his current deal. Walters was a target for Norwich, but Scholes is yet to increase the length of the club's contract offer. "In 99% of cases, it's about finding a compromise," he told BBC Radio Stoke. "We hope it'll be sorted on our terms, he hopes on his terms. Players will always want what they believe they're worth and why shouldn't they? Birkenhead-born Walters has scored 53 goals in 217 appearances for Stoke City, 28 of which have been off the bench. He made his name at Ipswich following a £150,000 move from Chester before being signed for Stoke by Tony Pulis for £2.75m in August 2010. Has scored seven goals in 35 games for the Republic of Ireland. "They employ agents and it is the agent's job to understand what the marketplace is like and how that translates into the value for their own player. "As players get older, the terms of the contract become important. But, as a club, we have to be careful not to over-extend ourselves." Scholes said that, since the transfer window came and went without Walters moving on, he has responded well. The striker has netted in three straight games, including Saturday's opener in Stoke's first league win of the season, against Bournemouth. "We disagree with him on the contract he should have going forward and we have not been able to agree anything yet," added Scholes. "But we still get on. And, in the last couple of games, he's been fantastic. He has shown what a great professional he is. "No matter what the issues are going on, when he crosses that white line, he focuses on the game."